UMT Intro Pack - Starter Kit includes: Prep 1, Prep 2 and Basic Music Theory Workbooks, Basic Answer Book, Small Whiteboard Plus 2 Rulers! 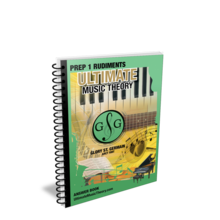 UMT Intro Pack - Starter Kit is the perfect for learning or teaching Beginner Music Theory. The UMT Intro Pack - Starter Kit includes: Prep 1, Prep 2 and Basic Music Theory Workbooks, Basic Answer Book, Small Whiteboard Plus 2 Rulers! Prep 1, Prep 2 and Basic Workbooks - Each coil bound (9 X12) workbook contains 12 Lessons, Review Tests, Guide & Chart! Prep 1 Answer Book has been added successfully to your wishlist. Ultimate Tote Bag has been added successfully to your wishlist.